ORCID number: Jennifer L Leiting (0000-0002-5784-7937); Travis E Grotz (0000-0002-7753-097X). Author contributions: Leiting JL and Grotz TE conceived and drafted the manuscript. Both authors approved the final version of the article. Conflict-of-interest statement: The authors have no conflict of interest to declare. Peritoneal carcinomatosis (PC) from gastric cancer has traditionally been considered a terminal progression of the disease and is associated with poor survival outcomes. Positive peritoneal cytology similarly worsens the survival of patients with gastric cancer and treatment options for these patients have been limited. Recent advances in multimodality treatment regimens have led to innovative ways to care for and treat patients with this disease burden. One of these advances has been to use neoadjuvant therapy to try and convert patients with positive cytology or low-volume PC to negative cytology with no evidence of active peritoneal disease. These strategies include the use of neoadjuvant systemic chemotherapy alone, using neoadjuvant laparoscopic heated intraperitoneal chemotherapy (NLHIPEC) after systemic chemotherapy, or using neoadjuvant intraperitoneal and systemic chemotherapy (NIPS) in a bidirectional manner. For patients with higher volume PC, cytoreductive surgery (CRS) and hyperthermic intraperitoneal chemotherapy (HIPEC) have been mainstays of treatment. When used together, CRS and HIPEC can improve overall outcomes in properly selected patients, but overall survival outcomes remain unacceptably low. The extent of peritoneal disease, commonly measured by the peritoneal carcinomatosis index (PCI), and the completeness of cytoreduction, has been shown to greatly impact outcomes in patients undergoing CRS and HIPEC. The uses of NLHIPEC and NLHIPEC plus NIPS have both been shown to decrease the PCI and thus increase the opportunity for complete cytoreduction. Newer therapies like pressurized intraperitoneal aerosol chemotherapy and immunotherapy, such as catumaxomab, along with improved systemic chemotherapeutic regimens, are being explored with great interest. There is exciting progress being made in the management of PC from gastric cancer and its’ treatment is no longer futile. Core tip: Peritoneal carcinomatosis (PC) from gastric cancer, along with positive peritoneal cytology, are associated with poor overall outcomes. The treatment of patients with this disease burden has greatly improved and new multimodality treatment regimens have been introduced. Some of these include neoadjuvant laparoscopic heated intraperitoneal chemotherapy and bidirectional therapies like neoadjuvant intraperitoneal and systemic therapy. Appropriate patient selection remains crucial for optimal outcomes but we can be optimistic about the prospects for carefully selected patients with PC from gastric cancer. Gastric cancer, more than any other malignancy, has a particular predilection for peritoneal dissemination. The incidence of peritoneal carcinomatosis (PC) at diagnosis ranges anywhere from 5%-30% depending on the staging modality used[1,2]. Furthermore, PC is the most common form of relapse after undergoing curative resection as 30% of all recurrences are in the peritoneum and up to 60% of patients have PC at their time of death[3,4]. Imaging is inadequate with computed tomography (CT) scans having a sensitivity of only 33% and specificity of 99% for detecting PC and 2-[18F]-Fluoro-2-Deoxy-D-Glucose ([18F]FDG) and positron emission tomography (PET) scans having a senstivity of 28% and specificity of 97%. Therefore, diagnostic laparoscopy and peritoneal cytology is indicated for clinical stage T1b or higher gastric cancer as a vital step to detect radiologically occult PC in nearly 40% of patients[6,7]. The presence of microscopic cancer cells within the peritoneal cavity can be identified in up to 6% of patients with no other evidence of metastatic disease. Patients without visible peritoneal metastases but with positive cytology are considered to have stage M1 disease according to the most recent American Joint Committee on Cancer (AJCC) staging as the outcomes are more similar to patients with gross peritoneal metastasis than those with local disease only[9-11]. PC from gastric cancer has generally been considered a terminal progression of disease and has worse outcomes than PC from other malignancies such as ovarian cancer or appendiceal cancer[9,10,12]. Survival for patients with PC is limited but varies based on the burden of disease. A recent series from MD Anderson of patients treated with modern systemic chemotherapy reported 1 year survivals of 24%, 57% and 84% for patients with radiographic PC, PC identified on diagnostic laparoscopy only and positive cytology only, respectively. A similar report from Memorial Sloan-Kettering confirmed a poor overall survival (OS) for patients with gastric cancer and peritoneal cytology with a median OS of 1.3 years compared to 0.8 years for patients with radiographic evidence of peritoneal disease. The management of patients with positive peritoneal cytology is an evolving field. The role for gastrectomy in patients with limited primary disease and positive cytology without any other peritoneal disease has been debated. Some small studies have shown a survival benefit with a gastrectomy in this subset of patients[14,15]. However, gastrectomy in the setting of untreated positive peritoneal cytology invariably leads to recurrence. National Comprehensive Cancer Network (NCCN) guidelines recommend peritoneal cytology be managed similar to other patients with metastatic gastric cancer with systemic chemotherapy and no surgery. The need to overcome this seemingly small volume and yet unfavorable disease burden has led investigators to seek ways to convert patients with positive cytology to negative cytology so they can proceed to a curative intent gastrectomy (Table 1). The use of neoadjuvant chemotherapy is one of these methods. Aizawa et al found that 23 of 47 patients (48.9%) with positive cytology converted to negative cytology after neoadjuvant systemic chemotherapy. R0 resections were able to be performed on all patients. The patients who had a conversion to negative cytology and underwent salvage gastrectomy had a survival benefit of 30.4 mo vs 15.0 mo (P = 0.03) when compared to those who had persistently positive cytology treated with gastrectomy. Similarly, a study from Memorial Sloan-Kettering demonstrated that 21 of 48 (44%) patients with initially positive peritoneal cytology treated with systemic chemotherapy achieved negative cytology on repeat laparoscopy. Unfortunately, the Aizawa et al study reported that 19% of patients progressed on systemic chemotherapy and the MSKCC study reported that 56% had disease progression while receiving systemic chemotherapy. Therefore, better induction treatments are needed[7,17]. Table 1 Studies with positive cytology or low volume peritoneal carcinomatosis. NA: Neoadjuvant; chemo: Chemotherapy; OS: Overall survival; NLHIPEC: Neoadjuvant laparoscopic hyperthermic intraperitoneal chemotherapy; MMC: Mitomycin C; PC: Peritoneal carcinomatosis; IP: Intraperitoneal; IV: Intravenous; 5-FU: 5-fluorouracil. One potential induction treatment is neoadjuvant laparoscopic hyperthermic intraperitoneal chemotherapy (NLHIPEC). In a small phase 2 study, Badgwell et al found that 7 of 19 patients (36.8%) with positive peritoneal cytology or low volume PC had resolution in their peritoneal disease and 5 were able to proceed to gastrectomy. Of note, all patients had undergone systemic chemotherapy before being enrolled in the study. Median OS from the time of diagnosis for the entire cohort was 30.2 mo and median OS for the patients who proceeded to gastrectomy was 29 mo from the time of their resection. This approach utilized systemic chemotherapy first, followed by direct intraperitoneal therapy, with encouraging results. Unfortunately, 63.2% of patients had persistently positive cytology or residual PC and did not go onto salvage gastrectomy. Neoadjuvant intraperitoneal and systemic chemotherapy (NIPS) is another method that utilizes systemic chemotherapy and intraperitoneal chemotherapy, but performs this at the same time in a bidirectional design. Fujiwara et al reported 14 of 25 patients (56%) had resolution of their peritoneal disease with either negative cytology or complete regression of PC. Median OS rate for the group with resolution of peritoneal disease was 27.1 mo vs 9.6 mo (P < 0.0001) in patients with persistently positive cytology or residual PC. Ishigami et al looked at the safety and efficacy of bidirectional treatment for patients with positive cytology or PC. They showed a median OS of 22.5 mo and 1-year survival rates of 78%. The role of gastrectomy in patients with peritoneal disease was addressed in the REGATTA trial. This phase 3 trial enrolled 175 patients with a single incurable factor and randomized them to systemic chemotherapy alone or gastrectomy plus systemic chemotherapy. PC was the incurable factor in three-quarters of the patients enrolled. The authors reported no survival benefit to patients undergoing gastrectomy in addition to systemic chemotherapy. This confirmed that removing the primary tumor without addressing the metastases is not beneficial to the patient. 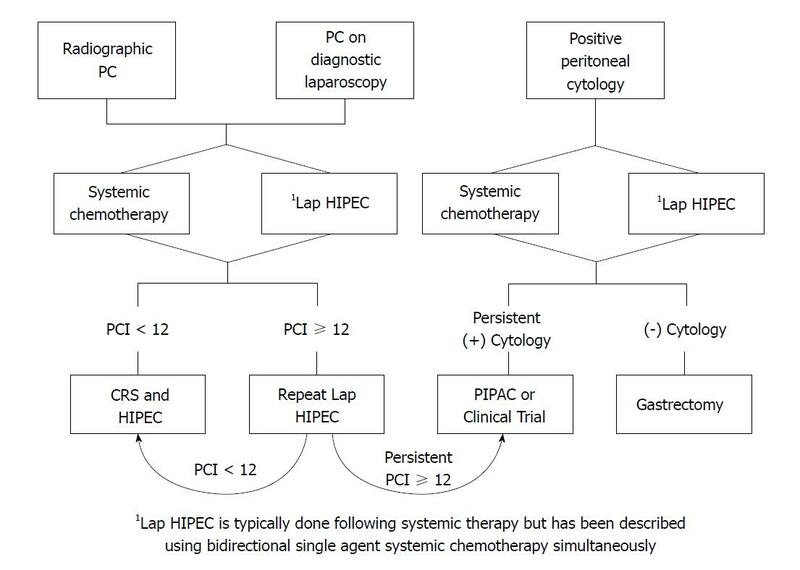 Cytoreductive surgery (CRS) and hyperthermic intraperitoneal chemotherapy (HIPEC) attempt to address both the primary and the peritoneal metastases simultaneously (Table 2). This aggressive approach has been investigated for gastric cancer since the late 1980’s[22-24]. It includes resection of all visible tumor from the peritoneal cavity, followed by the instillation of HIPEC. For the past 30 years, CRS combined with HIPEC has remained the only potentially curative treatment for this advanced stage of gastric cancer[25,26]. A recent meta-analysis that included 11 randomized controlled trials and 21 high quality prospective studies demonstrated an increased median survival of 4 mo in patients with gastric cancer PC treated with HIPEC, however, the HIPEC group did experience a higher risk of severe complications. Similarly, CRS and HIPEC have shown a significant improvement in survival for patients with PC from other primaries like appendiceal and ovarian cancer[28,29]. Table 2 Studies for peritoneal carcinomatosis with cytoreductive surgery. 1Abstract only, agents used not included. CRS: Cytoreductive surgery; HIPEC: Hyperthermic intraperitoneal chemotherapy; OS: Overall survival; MMC: Mitomycin C; PIC: Perioperative chemotherapy; EPIC: Early postoperative intraperitoneal chemotherapy; SC: Systemic chemotherapy; NA: Neoadjuvant; IP: Intraperitoneal; NLHIPEC: Neoadjuvant laparoscopic HIPEC; NIPS: Neoadjuvant intraperitoneal and systemic chemotherapy; PCI: Peritoneal carcinomatosis index. Furthermore, the recent CYTO-CHIP study investigated whether CRS alone was beneficial compared to CRS with HIPEC. They found a significantly improved OS in the CRS with HIPEC group (18.8 mo vs 12.1 mo), suggesting that it is the combination of CRS and HIPEC that improves survival. Yang et al reported similar results with improved survival for CRS and HIPEC when compared to CRS alone. Median OS for patients undergoing CRS and HIPEC was 11.0 mo compared to 6.5 mo (P = 0.046) for CRS alone. Lastly, in a large retrospective study, Glehen et al reported a 9.2 mo median OS for 159 patients undergoing CRS with HIPEC or EPIC, with improvement to 15 mo if the cytoreduction was complete. The benefit of CRS and HIPEC over systemic chemotherapy alone was shown by Rudloff et al. In a small cohort of 16 patients, those that underwent CRS, HIPEC, and systemic chemotherapy had an overall median survival rate of 11.3 mo compared to 4.3 mo in the systemic chemotherapy alone group. Unfortunately, although these studies all demonstrated a modest benefit to CRS and HIPEC, OSs remain unacceptably low. It appears that not all patients benefit from CRS and HIPEC and that appropriate patient selection is vital in to order to optimize outcomes. The two most commonly found prognostic factors for survival are consistently the extent of disease, most commonly measured by the peritoneal carcinomatosis index (PCI), and the completeness of cytoreduction. Glehen et al showed that the PCI was the only independent prognostic factor in patients with a complete cytoreduction. No patient survived more than 3 years if their PCI was > 12. A meta-analysis confirmed this with no patients being alive after 3 years if their PCI was > 12. A lower threshold of PCI ≤ 6 was an independent prognostic factor for patients undergoing CRS and HIPEC after bi-directional chemotherapy (HR 2.16, 95%CI: 1.17-3.98, P = 0.013) in a recent Japanese study. Similarly, Chia et al found that a PCI of < 7 was a significant predictor of survival. Those with PCI < 7 had a median OS of 26.4 mo compared to 10.9 mo in those who had a PCI ≥ 7 (HR 2.67, 95%CI: 1.54-4.64, P < 0.001). All the patients who were considered cured as defined by being disease-free at 5 years had a PCI < 7. This same PCI cut-off was seen in a study by Yonemura et al who found that a PCI < 7 was associated with improved survival (median survival 2.8 years vs 1.1 years, P = 0.0001). With a lower volume of disease, there is a higher probabilty of being able to completely remove all the metastatic disease. This is the only population that can be expected to have a chance at long-term survival. A meta-analysis showed that cytoreductive scores of 0 or 1 significantly improved survivals in patients with gastric PC. Glehen et al showed that patients undergoing a complete cytoreduction with a CC score of 0 or 1 achieved a median OS of 21.3 mo compared to only 6 mo for those with an incomplete cytoreduction. The 5-year OS was 29.4% for those who attained a complete cytoreduction with no survivors in the incomplete cytoreduction group. Canbay et al used bidirectional therapy (neoadjuvant systemic and intraperitoneal therapy) to reduce the volume of disease before CRS and HIPEC for patients that responded to treatment. They found better OS in patients who responded to the neoadjuvant treatment and were able to undergo CRS and HIPEC (15.8 mo vs 7.5 mo). There is substantial interest in novel and innovative ways to reduce the PCI prior to cytoreduction. This is crucial because PCI is a determinant in achieving a complete cytoreduction and only patients with a low volume of disease who undergo a complete cytoreduction have a long-term survival benefit from the procedure. Yonemura et al used NLHIPEC and NLHIPEC plus NIPS to try and reduce PCI levels before CRS. They found that while NLHIPEC alone reduced PCI levels (14.2 ± 10.7 to 11.8 ± 11.0, P = 0.023), NLHIPC plus NIPS doubled the PCI reduction (14.8 ± 11.4 to 9.9 ± 11.3, P < 0.0001). This may provide more patients with the opportunity for a complete cytoreduction when this would have otherwise not been possible due to a high PCI. Even with all the advances in therapy for patients with PC from gastric cancer, there are still a large number of patients who are not eligible for these therapies given their high tumor burden or conditional status. Palliative treatment for these patients includes chemotherapy, chemoradiation, or supportive care. None of these regimens treat the peritoneal disease burden and patients generally have very limited survivals. A new experimental therapy that has emerged to treat these patients is pressurized intraperitoneal aerosol chemotherapy, or PIPAC. This method delivers aerosolized chemotherapy to the peritoneum. The benefit of this method is that the pressure allows for greater lesion penetration as well as allowing for diffuse and even coverage throughout the abdomen. This deeper penetration is likely more critical in these patients with advanced bulky peritoneal metastases. Nadiradze et al recently published data on 24 patients with end stage gastric cancer with PC. These patients underwent 1 or more rounds of PIPAC with doxorubicin and cisplatin. The median OS for these patients was 15.4 mo with 52% alive at one year. A multi-center study of PIPAC for advanced PC from a variety of histologies including gastric cancer demonstrated that 63.5% of patients achieved resolution of symptoms. This therapy may prove to be beneficial for more than just end stage gastric cancer patients but additional research is needed. Innovative discoveries and continued efforts to optimize treatment for patients with PC from gastric cancer are needed. This includes improved systemic chemotherapy options such as FLOT, which has been demonstrated to be effective in patients with limited metastatic disease. The AIO-FLOT3 trial reported a median OS of 31.3 mo and a 60% radiographic response rate for patients who were treated with perioperative FLOT systemic chemotherapy and surgical resection of all metastatic disease. Another innovative approach is the use of immunotherapy, like catumaxomab, as an intraperitoneal treatment (Table 3). Catumaxomab is an antibody that binds to both epithelial cells through epithelial cell adhesion molecule (EpCAM) and T-cells through CD3. Gastric cancer expresses high levels of EpCAM so the intraperitoneal administration of EpCAM provides targeted therapy to peritoneal implants. In patients with malignant ascites from PC of gastric origin, it was found to significantly prolong OS from 44 to 71 d. Bokemeyer et al conducted a phase 2 study where patients underwent intra- and post-operative intraperitoneal catumaxomab administration after undergoing neoadjuvant chemotherapy and resection. These patients had four-year disease-free survival rates of 38% and four-year OS rates as high as 50%. Though catumaxomab is no longer available, the use of intraperitoneal immunotherapy remains promising and is under continued investigation. OS: Overall survival; NA: Neoadjuvant; DFS: Disease free survival. There remain many areas related to the management of PC from gastric cancer that can be improved. Better detection of early occult peritoneal metastases would allow the clinician to select more appropriate patients for these multidisciplinary treatments. This may be in the form of improved imaging modalities like fluorescence and antibody-labelled imaging or the use of RT-PCR with cytology to improve the sensitivity of detecting cancer cells in peritoneal washings. The optimal chemotherapeutic agent, or agents, to use is unclear, both systemically and in the peritoneal cavity. Many of the studies discussed here used different treatment regimens with some varying even within the same study, so it is difficult to compare outcomes from one study to the next. Also, the ideal sequence, route, and duration of treatment for these patients that will deliver the greatest long-term benefit with manageable side-effects is unknown, though there are many promising options. Appropriate patient selection remains crucial for optimal outcomes in patients with gastric cancer, but patients with PC or positive cytology should no longer be immediately excluded from potentially curative multimodality treatment regimens. There are treatment options that can be offered to suitable patients with PC from gastric cancer that have the possibility of extended survival (Figure 1). We are finally seeing progress in the management of a disease that has traditionally been thought of as terminal and it is time to change our approach. We are not yet at a point where we can offer these patients a cure, but the treatment of PC from gastric cancer is no longer a futile endeavor and can be approached with careful optimism. Figure 1 Treatment algorithm for gastric cancer peritoneal carcinomatosis. PC: Peritoneal carcinomatosis; CRS: Cytoreductive surgery; HIPEC: Hyperthermic intraperitoneal chemotherapy; PCI: Peritoneal carcinomatosis index.